Former Head of Disney University Training Team Doug Lipp at the Lead-In 2017. With businesses having fully established the need to go digital, talks are now about the process of digital transformation and how to face disruptions along the way. In Globe Business' 2017 Leadership Innovation Forum (Lead-In 2017) attended by over 500 top officials from various enterprises, Globe Telecom brought in key innovation speakers who embodied passion and purpose that are considered pillars of great leadership in line with the theme "Unlocking the Bigness Beyond Business." "This year’s convergence is a beginning, a gateway, an opening that invites us to unlock the potential of bigness beyond business," said Peter Maquera, Globe Senior Vice President for Enterprise Group. 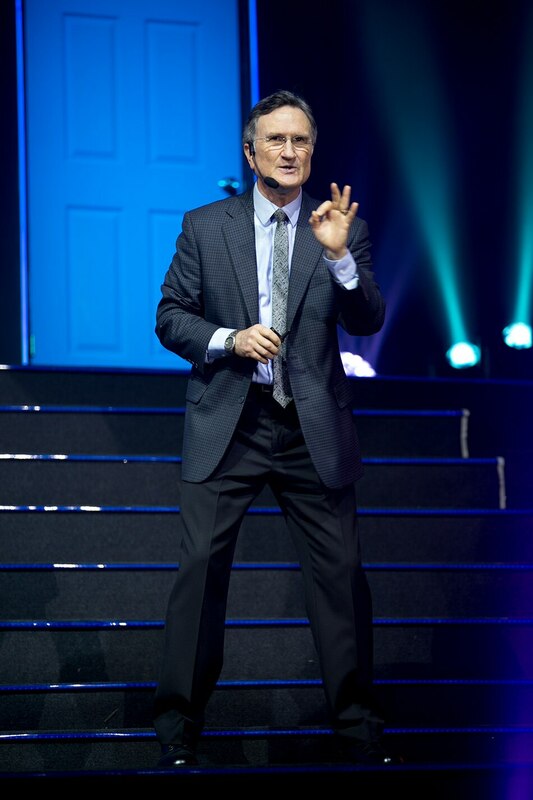 Doug Lipp, former head of Disney University Training Team at Disney Corporate Headquarters, author, and influential speaker, delivered the keynote address that discussed "Leadership and Service Magic: 7 Ways to Unlock Bigness Beyond Business." The eight-time author noted the problem that confronts businesses today, which is fewer people are willing to take risks. Risks, he said, are not confined to starting businesses but established enterprises must also be willing to take risks in order to evolve in the ever-changing digital world. Lipp highlighted the three principles that businesses must keep in mind to be able to take risks: hire right, train right, and treat right. In his talk, Lipp acknowledged the need for companies to recognize diversity among its employees and their ideas. He explained the need to seek people who offer different perspective and are willing to challenge status quo: "If you only have one perspective and you only see things the way you want to see them, you are not going to see the possibilities for all the doors," Lipp said. But it should go beyond hiring the most competitive people in the industry, Lipp explained. There is a need to train them properly for the job at hand as well as give them the treatment that would boost their confidence. "A dysfunctional team is when the leader is doing too much," Lipp explained. "You have to identify what is your essence or why do you even exist in the first place." Lipp went on to advise organizations in trying to differentiate dreamers from doers among their employees: "Dreamers are those who are able to think new ideas and they are never satisfied. Doers, on the other hand, are the people who help dreamers bring to life these ideas and challenge them with (these) ideas." From the spreadsheet of steps on going beyond business and organizational improvements is establishing a values-driven enterprise, how the organization treats its customers must also reflect the way it treats its employees, according to Lipp. Brian Cu, Country Head of Grab Philippines, and Barry Lerner, South Pacific Regional CIO of Huawei, were also featured speakers for the Lead-In. Cu discussed how Grab was built on the value of innovation, where it aimed to go beyond the norm of transportation and provided people with a better experience. He instilled the value of innovation and its importance in transcending beyond "who we are, what we have, and what we do". Lerner's presentation, on the other hand, did not only give the audience a glimpse of a future-ready city but it also gave a clear picture of what companies can achieve if it couples innovation and leadership. By taking the lead in advancing technology and practicing responsible citizenship, enterprises can influence a better way on how we take part in our own communities and in building the nation as a whole. Ultimately, the Lead-In instilled in organizations that they must realize the need of establishing a strong foundation to be able to reach their goals and these foundations need to have the right people. Bigness lies in the people -- in customers, in employees, in peers, in partners, in families, and in communities.